I figured the red of the dried cranberries would go perfect with green pistachios. As with most recipes I come up with, they always turn out amazing in my head and usually end up being mediocre at best. Preheat oven at 350 degrees. In a large bowl, beat egg whites with a pinch of salt until they just hold stiff peaks. Gradually beat in the sugar while constantly mixing it. Sift the flour and baking powder and add this mixture and whisk. 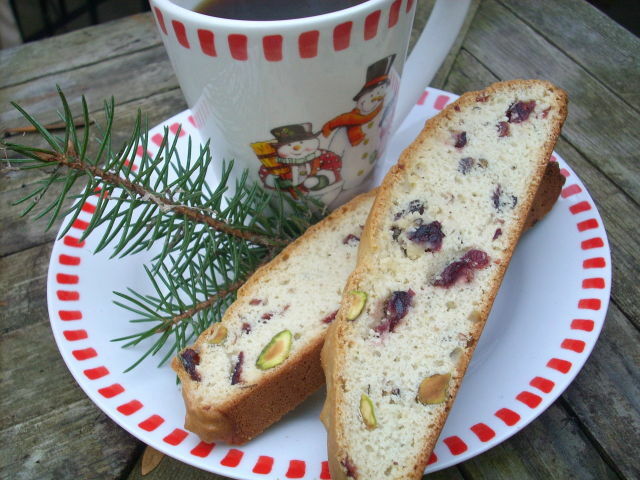 Blend in the olive oil, milk, nuts, cranberries and vanilla and mix well to get a sticky dough. Now at this point, it was a very sticky dough, so I just scooped it out of my bowl onto my baking sheet. I sprayed my hands with Pam and molded the dough into one giant log. Bake for 25 to 30 minutes. Remove and let sit for at least 10 minutes to cool. Now slice into biscotti-sized thick bars and return to the pan, lining them up side by side, but allowing room for them to get crispy, and return to oven for 20 to 25 more minutes at a reduced temperature of 300 degrees. You could lower the amount of carbs by using Splenda, but I was all out. After they cool, they can be stored in an airtight container. Enjoy! I love my snowman dishes! And I am glad we have pine trees in the back yard for my garnish! Lunch will be posted at dinner since my lunch break is over. See you then!